I like to compare leg workouts to chest workouts. It is common practice to work the chest on an incline, on a decline, or on a flat bench. We use all of these positions to train our chest from various angles because we know it brings great results. But for some reason, we don't do the same thing for our legs. This might be why you see so many dudes with giant chests and little toothpick legs. Despite the intricacy of our legs, most of us train them through the exact same angle every time. 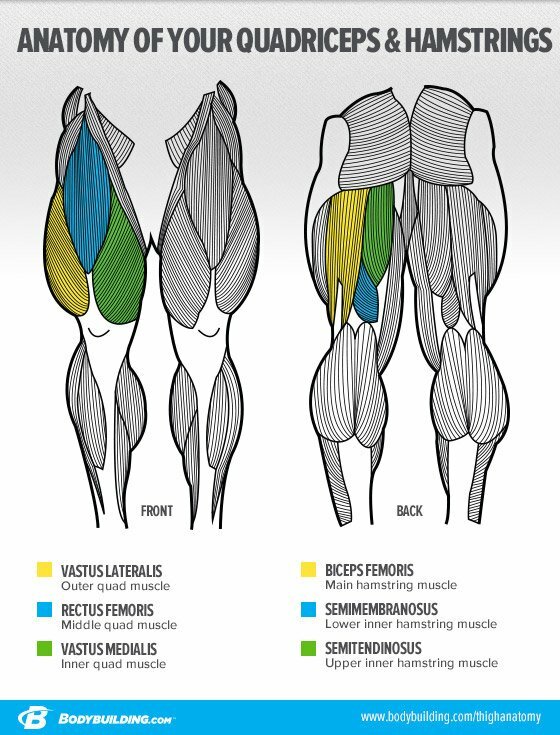 Although it's become common practice to train our upper bodies in multiple planes of movement, we generally stick to very little variation for our legs. If you want to increase the size of your legs, you need to learn how to train them from multiple angles. If you're not sure where to start, I've got your back! Here are some ways you can make small changes to your body position to alter muscle recruitment and thus improve the size and shape of your legs. I suggest trying three different squat positions: wide with toes pointing out, shoulder-width with toes very slightly out, and a narrow stance (feet inside the shoulders) with toes straight ahead. By experimenting with your stance, you'll be able to feel which muscles are working hardest. Keep in mind that your toe angle doesn't have to be extreme. One inch either way will be enough. If you're experimenting with your foot angle, you don't need to stress about how low you squat or how much weight you do. We're bodybuilding, not powerlifting. Do squats to the best of your mobility. Where your feet are placed during leg extensions will vary the tension on the quads. If you have been doing leg extensions with your feet perfectly aligned your entire life, you've been missing out. I hear many people complain about pain in their knees caused by leg extensions, or so they think. This is often caused by a muscular imbalance in the quadriceps. Usually, the medialis is overdeveloped or underdeveloped, which can cause the kneecap to be pulled to one side. Balance is important not only to how your legs look, but to the health of your joints. To achieve balance, you need to train the quads properly. Simple adjustments can make all the difference in the world. If you want to train the tear drop hard, turn your foot out like a duck and do 3/4 reps with a pause at the top. Hit the vastus lateralus by pointing your toes inward. You'll feel that sweep on your outer quad like you never have before. Both of these movements will be much more effective when performed one leg at a time. If your goal is to work on the rectus femoris, set the seat a bit farther back and perform the extension with your foot pointed forward. Before beginning the rep, flex at the hips and pull your legs up as if you're doing a knee tuck. This will engage the muscle where it starts at the hip flexor and inserts at the knee joint. You'll notice that you'll have to work with substantially less weight and concentrate on your hips. We can emphasize the different portions of the hamstrings in the same fashion. Pointing your toes out will place the workload mainly on the biceps femoris, while pointing your toes inward places more stress on the semimebranosus and semitendinosus (medial hamstrings). It's much easier to manipulate your leg angle if you do this exercise on a standing leg curl machine. I constantly hear "I need to work on my glute-ham tie-in" from competitors, especially bikini girls. Well, there is no such thing as the glute tie-in muscle. What you really need to do is sculpt your glutes and hamstrings—especially your adductor magnus, the largest of your adductor muscles. Unfortunately, hamstring curls do not activate the adductor magnus, and far too many people miss that information. Three great ways to engage this muscle are one-leg barbell squats, goblet squats, and Romanian deadlifts with a wider stance. The one-leg barbell squat has the advantage of working the adductor as both a stabilizer and a hip extensor at the same time. I like to have people lean slightly forward at the hips when going down and then stand straight back up to engage the hip extensor.